Another band jumps off the music biz's sinking ship. Last week brought news of Radiohead's parting ways with the recording industry for its new album. Now another band has jumped the sinking ship. 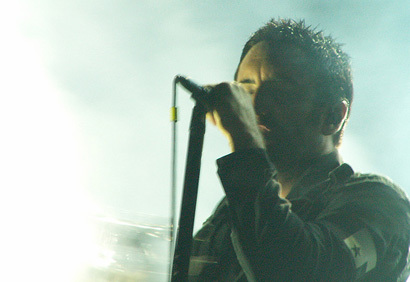 In a post yesterday on the band's site, Nine Inch Nails' frontman Trent Reznor declared, "I've waited a long time to be able to make the following announcement: as of right now Nine Inch Nails is a totally free agent, free of any recording contract with any label." I have been under recording contracts for 18 years and have watched the business radically mutate from one thing to something inherently very different and it gives me great pleasure to be able to finally have a direct relationship with the audience as I see fit and appropriate. Look for some announcements in the near future regarding 2008. Exciting times, indeed.